A drive down HWY395, through the twisted hills of California and Nevada high desert, leads you to an otherworldly valley. The maw of which expands from a 180 degree panorama. On my right, a view of the currently pithy Sierra Nevada mountain range. Normally flocked with snow, a historic drought steals the majesty of blinding white off these mountains. To the left, an expanse of rolling hills towards Nevada desert. Directly ahead, the brine of Mono Lake, brimming not with fish, but algae, insects, the occasional aves and of course, the rush of earth herself, salt, carbonate and water. A blinding wave of soda deposit catches your eye first, since searing white upon a beige landscape tends to do that. Sodium bicarbonate, or commonly baking soda and in this form, nahcolite, breaches the shore of the lake. White hot deposits leave the encrusted earth a fine and powdery pale. The smooth gradient of orange, to cyan, to blue sky, seemed one of the highlights of the trip. Rock formations linger just below the surface, as tufa hovers in the background. The next morning saw the other side of the lake. Driving just 20 minutes from the small town of Lee Vining and you find yourself in a tufa forest; Mineral deposits leftover from a long recessed lake reveal climbing columns of everyday rock. Though I was a little disappointed by overcast, the toxic colors of the lake still managed to spring out. Awash in a gray landscape, the greens and yellows of shrub of algae certain made a nice, if morbid, addition. Add to that a deeply muddled sky and surrounding desert landscape and I almost feel like I’m on some distant moon, rather than eastern California. Is all that worth it? Yah, the drive from the central valley can get a bit long, and sure the lake gets pretty stinky (I’d hate to smell it during summer) but it sure got me out of a rut I’d been in the past few weeks. 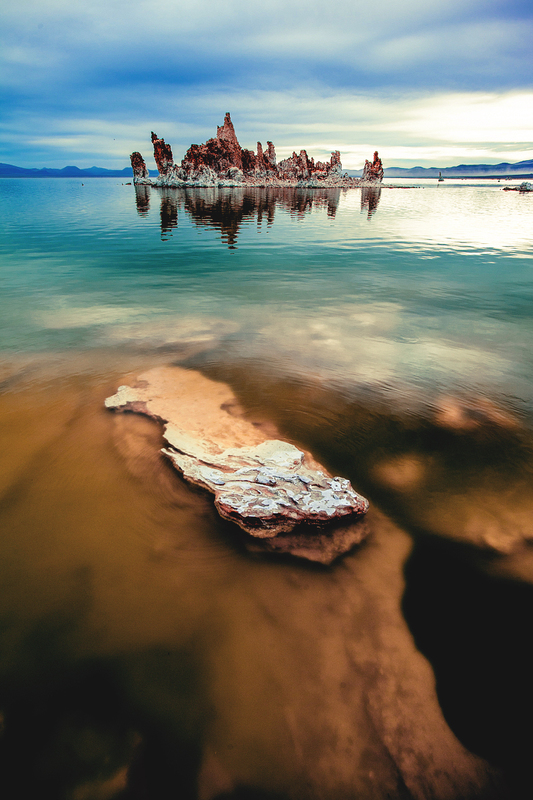 If anything, Mono Lake offers the surreal, a lovely escape from your ordinary. Walking around a forest of semi-ancient rock does wonders for the soul. My suggestion, go during the off-season. Normal winters find this a somewhat tough place to get to. We found everything a breeze, the cheap hotel, the drive, and of course, the weather.